Welcome to Pacific Systems Group, providing mainframe software solutions since 1981. We specialize in custom report and file manipulation utilities. Below are overviews of our premier products. Click on a product name to explore it further. Then download your free 30-day trial today! Or click here to see all of our products. Z-Writer is the quick-code utility for z/OS mainframes. Its native syntax is very similar to competing quick-code tools such as DYL-280, Easytrieve, Quikjob and CA-Earl. If you are using one of those programs, you'll be able to run your existing programs on Z-Writer with only minor changes. And with our ZWDYL interface, you can actually run all your existing DYL-280 (VISION:Results) program without any changes to either the program code or the JCL. Our ZWQUIK interface (beta) lets you do the same thing for your Quikjob (VISION:Report) programs. Z-Writer's annual costs are much lower than the competing products. Explore this chance to finally say good-bye forever to your expensive CA product. Spectrum SMF Writer is a powerful SMF report writer and PC-export utility for z/OS mainframes. Spectrum SMF Writer offers an easy, economical way to produce custom reports from your company's SMF files. Or use it export your SMF data for use in PC programs. The SMF and RMF files are among the most complicated files in any shop. 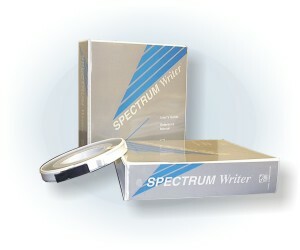 But Spectrum SMF Writer makes it easy and inexpensive to produce reports from them. Don't wait to start unlocking the treasure of performance, capacity and monitoring data hidden deep within your SMF files. Spectrum SMF Writer is much less expensive (easier to use) than such SMF reporting alternatives as SAS with MXG. Spectrum Writer is the 4GL report writer and file-format utility for z/OS and VSE mainframes. It's easier to use and more powerful than report writers costing much more. Spectrum Writer lets programmers and end users quickly produce production reports, custom one-time reports, analyses and queries. Spectrum Writer is also a powerful format utility that extracts mainframe data and formats it any way you need it-- for PC spreadsheets or databases, etc. Spectrum Writer can even format your mainframe data as HTML for viewing on your Internet or Intranet site, or to send by e-mail. Learn more about Spectrum Writer and download your own free 30-day trial of this powerful 4GL report writer.